S TX Finland Oy’s Turku shipyard has delivered a next-generation cruise ferry to Viking Line ABP. M/S Viking Grace, described by STX as the most environmentally friendly large cruise vessel ever built, uses Liquefied Natural Gas (LNG) as fuel. Building started at the STX Turku shipyard in September 2011 and the ship was floated out in August 2012, providing some 2,600 man-years of labour to the shipyard. The ship’s emissions into the sea have been eliminated, and emissions into the air are remarkably lower than those of any other large passenger ships. 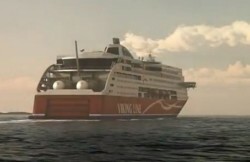 Viking Line selected the cleanest fossil fuel available today, LNG, for its major environmental advantages. By using natural gas the hazardous emissions will decrease to a minimum. Nitrogen emissions and particulates are reduced by 85 per cent and greenhouse gases by 15 per cent. Sulphur emissions are practically zero. “ We are proud to be able to deliver a superb, technically advanced cruise ferry to a Finnish shipping company. We are certain that the ship will be a great success on the route between Turku and Stockholm. The building process of this vessel has provided us with valuable know-how on putting the developing technology for gas-fuelled ships into practice,” says Jari Anttila, EVP and COO of STX Finland Oy, and Director of STX Turku Shipyard. M/S Viking Grace will enter traffic on the Turku (Finland) – Åland Islands – Stockholm (Sweden) route on 15 January 2013. The 218 m vessel is capable of 22 knots and can carry 2800 passengers in 800 cabins. It provides 1,275 lane metres for cargo and 1,000 lane metres across decks 4 and 5 for vehicles.